A screenshot taken from a video filmed at Kings Cup CEI in Bahrain, where a top-placed horse was illegally injected in the final vet-gate. Prominent figures in Bahrain endurance are being investigated by the FEI following allegations that a top-placed horse in last weekend’s King’s Cup race was illegally injected in the final vet-gate. 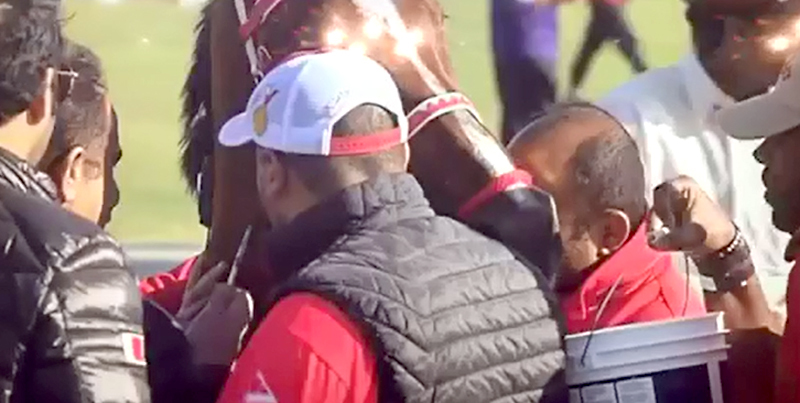 It has also emerged that Ahmed Janahi, registered trainer of the horse, was provisionally suspended on Wednesday (March 6th) by the FEI in connection with a prohibited substances offence involving another horse. The FEI has received a copy of a video which was apparently taken off an official live broadcast from the King’s Cup, Bahrain’s most prestigious endurance race, posing questions why no stewards or judges noticed the incident on the day. The video has been widely shared on Facebook (see below). It shows several people including Janahi (tall, in black jcket and sunglasses) clustered round Tammam de Lizonne while someone injects him in the neck. The horse went on to return an astonishing heart-rate of 46bpm at the final vet inspection. He placed third under rider Sheikh Mohammed bin Mubarak al Khalifa, a member of Bahrain’s ruling family. Invasive treatment of any horse still in the competition is strictly forbidden under FEI rules. Once the horse is out of the competition but still at the venue, invasive treatment also needs official consent. A FEI spokesman told Horse-Canada.com: “As the incident shown in the video footage only came to light after the event, no action was taken by the Ground Jury at the time, but the FEI is looking into it and is currently collating a dossier of evidence. “Once this process has been completed, we will take the appropriate actions in line with the rules. Janahi and the rider are already answerable to the FEI Tribunal after Sheikh Mohammed’s ride Natfet tested positive to Trometamol, a diuretic, at the Al Ula ride in Saudi Arabia last month. Trometamol was a banned substance till reclassified as a controlled medication this year. This is Sheikh Mohammed’s second controlled medications offence in three years. The rider is no stranger to the FEI Legal department. He was disqualified by the FEI from winning the 2014 King’s Cup, and also suspended till the end of the Bahrain winter season by his national federation, for abuse of his ride Tarabic Carl. The FEI Tribunal that he summoned grooms from a moving vehicle onto the piste in the closing stages of the race and they struck his tiring horse several times. At his first race after that suspension was lifted, in France, Sheikh Mohammed al Khalifa was given a yellow warning card for abuse and served a further automatic two-month suspension under the “totting up” rule.